I'm living with a vampire. But you would never know it, because she's pretty darn adorable. And when she's at home, she isn't so... teethy. I have mentioned a few times in her monthly update posts, but Bimmer is a biter. 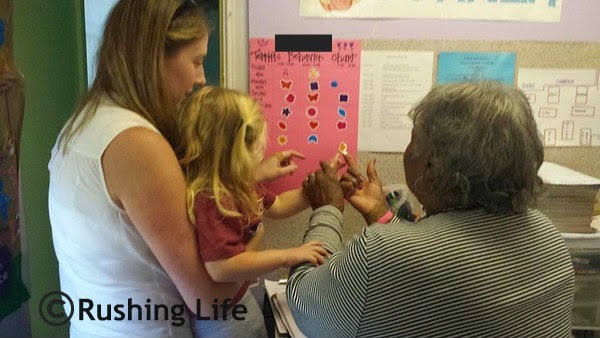 She has been since she was just over a year old and moved into the toddler class at school. She was bit a few times and something clicked... so she started biting. And she was BAAAAD for awhile. So bad that we had to meet with the teacher. Her recommendation? 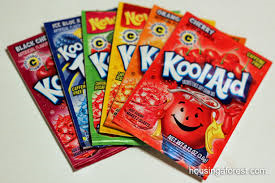 Kool-Aid powder. Apparently, it is super sour! And it seemed less horrible than say, hot sauce. So for a few weeks, whenever she would bite, she'd get a nice ol' spoonful of the stuff. And she eventually quit. No more biting. Yay! I could rest easy that she was not going to get kicked out! Fast forward to a few weeks ago. I noticed her biting was back... and getting more frequent. There was a span where she bit everyone every other day basically. So when I got a phone call in early October from daycare, I had to get out of a meeting to find out that Bimmer had bitten a little girl so hard that she drew blood. I was mortified. Bimmer helped me make it - hence the imperfections. LOL. It was a good behavior chart. If she was good all day at school, she would get a sticker when she got home. If she was good all week, she would get a present at the end of the week. We talked a lot about how important it was to be nice to our friends and be a good girl at school each day. When we met with the school the next day, the teachers were very adamant that Bimmer was doing it for attention. They told us how smart she is and that she realizes it gets her what she wants. 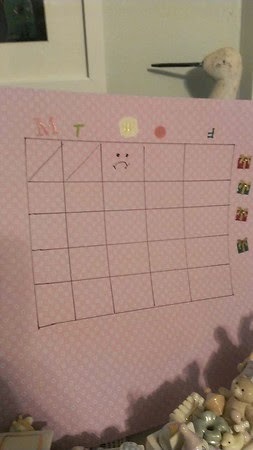 When I told them about the chart I was making at home, they agreed to make a chart to use at school too, so she would be accountable at school as well. The first week was a half week, but she didn't bite! Yay! So off to the dollar store we went. She got to pick whatever she wanted... and she chose a Care Bears coloring book. The next week, we took her to a local fancy-pants toy store and she got a spiky ball that when it bounces, it lights up. The next week? The $1 bin at Target yielded a bag of tiny dinosaurs. We were off to such a great start! Then... on a Thursday, she bit. Ugh. The next week? She bit again Monday AND Tuesday. She told me one day was because a girl poked her in the eye. The paper the teacher sent home on the other incident? That she bit for no reason, laughed, and then said "Sorry." What were we going to do?!? It's a work in progress. But the positive attention, versus the attention when she was biting, seems to be working. It isn't a flawless system, but it's a system I am willing to stick with for a few more weeks to see what happens. I know she knows biting is bad. She isn't stupid. Here's hoping it continues to work and register with her. And then eventually, we won't even remember that biting is an option!